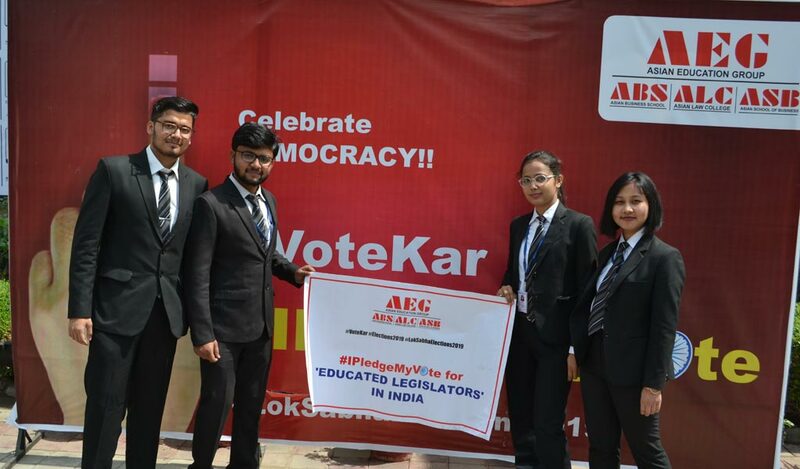 Asian LAW College / Campus Updates / Asian Law College students pitch-in their strong support for AEG’s #IPledgeMyVote for a better India campaign! Asian Law College students pitch-in their strong support for AEG’s #IPledgeMyVote for a better India campaign! In view of the forthcoming Lok Sabha Election 2019, students pursuing 5-year BA-LLB & 3-year LLB courses at Asian Law College (ALC) wholeheartedly participated in the ongoing #IPledgeMyVote for a better India campaign being conducted by the parent group, Asian Education Group (AEG). Students belonging to two other constituent group colleges of AEG – namely, Asian Business School (ABS) & Asian School of Business (ASB) – were also actively involved in this big nationalistic responsibility. Stemming out of the seed thought that “Voting is not just your RIGHT; It is also your RESPONSIBILITY!”, the campaign exhorts all conscientious citizens of India to not-to-forget their cardinal responsibility of exercising their franchise in choosing their best representatives for the most important ‘House’ of the supreme legislative body of the Republic of India – viz. the Lok Sabha (or the ‘Lower House’) within our Parliament of India. Seeking to celebrate the occasion as the “Festival of Democracy”, the campaign brings into focus the importance of the constitutional ‘Right to Vote’ by way of the students participating in a series of placard displays carrying relevant messages like “I Pledge My VOTE for a Better INDIA”, “I Pledge My VOTE for a Corruption Free INDIA”, “I Pledge My VOTE for a Strong INDIA”, “I Pledge My VOTE for Space Power INDIA”, “I Pledge My VOTE for Terrorism Free INDIA”, “I Pledge My VOTE for Global Leader INDIA”, and “I Pledge My VOTE for Super Power INDIA”. The campaign served as a practical exposure to the constitutional principle of governance and the students of ALC through speech ,placard and slogans motivated the Young India Voters, which is all set to be one of the deciding factor in the outcome of this Lok Sabha Elections 2019 with around 10 crore 1st Time Voters in 2019!